Florence is not only geographical but also a cultural heart of Tuscany. The number of masterpieces of this city is endless. The reason for that is that the most talented artists like Dante, Boccaccio, Brunelleschi, Giotto, Donatello, Botticelli, Michelangelo, da Vinci, Rafael and many other genius masters lived and worked here. They say that Florence has three hundred and fifty most brilliant artists out of thousand in Europe. You will be captivated nearly by every inch of Florence: streets and squares, bridges and the coastline, interior and exterior decorations. The city blossoms each time new visitors arrive. The legend says that the “city of flowers” Firenze (fiore it.– color) was founded by Julius Caesar. But the ancient history goes back to the Etruscan times and this period was truly followed by the Romans. Later these lands were occupied by Goths, Byzantines and Lombards. The development of Florence started in X century. In the beginning of XII century it became an independent commune. In XIII century it was proclaimed the Republic of Florence. Renaissance is the triumph of Florence’s cultural history. It was here this epoch had started. At that time Florence transformed into the most densely populated European city: 130 thousand citizens (in comparison with London – 40 thousand). The economy and culture of Florence was considered the most perfect at that time. Till present days this legacy attracts many tourists from all over the world. Florence is an amazing city which provides you with an incentive to study all of its ins and outs. You should start the sightseeing with Piazza della Signoria, an L-shaped square, situated in front of the palace which has two names: palazzo della Signoria or palazzo Vecchio. It is the place where priors were deciding the destiny of the citizens and the Republic. Savonarola spent the very last days of his life here in the tower under the bell in a little cubbyhole. A round plate in front of Neptune fountain reminds of his stake in the square. Plaza de la Signora is often described as the open air museum. You are not likely to meet such a number of magnificent sculptures not bounded by the museum walls anywhere else in the world. Among them – the ancient pieces of the Roman culture I century b.c. and works of the Renaissance: “Perseus with the head of medusa” by Cellini, “Judith and Holofernes” and “Marzocco” by Donatello, “Hercules with Kakus” by Baccio Bandinelli and others. The last sculpture, situated to the right from the entrance is famous for blocking a plain stone in the wall with scratched human profile. According to the legend this image was created by Michelangelo who bet that he could draw the picture of the criminal who was in the process of his execution by hanging without looking at the wall. You will find the copy of “David” nearby, the original, carved out of stone by Michelangelo is now in the Academy Gallery (galleria dell’Accademia). It was founded in the end of XVIII century and the students of the Art Academy situated not far away could study the masterpieces of sculpture and painting. The time had passed and many works filled the funds of the gallery, yet it became famous thanks to the collection of works of one master – Michelangelo. Galleria degli Uffizi keeps the largest collection of European painting of the Renaissance. The palace of XVI century stores the creations of such Italian artists as Giotto, Botticelli, Leonardo da Vinci, Rafael, Giorgione, Titian, fra Filippo Lippi, Cimabue, Piero della Francesca and many others. Here you may also see the samples of antique, French, Spanish, German, Dutch and Flemish art. Archeological museum in Florence retains the memory of the ancient epochs. Separate sections are dedicated to different cultures and times: Egyptiac, Etruscan, Attic and Roman. National museum placed in palazzo Bargello welcomes you with variety of halls: Medagliere di Firenze, la sala del Consiglio, la Sala delle Armi, la Sala degli Avori, la Sala dei Bronzetti, la Sala Islamica and others. Florence attracts us not only with palaces but also with temples. One of the earliest examples of transition from mediaeval gothic to Protorenaissance is the architecture of Santa Maria Novella basilica. San Miniato al Monte church, decorated with simple marble geometric drawing of various colours is an example of the so called inlaid style. Basilica Santa Croce is the largest Franciscan church in Italy which was founded by Francis of Assisi himself. Basilica is famous for the tombs of the great Italian artists: Michelangelo, Machiavelli, Galileo, Rossini. Interestingly enough Dante’s tombstone is here whereas he had been buried in Ravenna, where he spent the last years of his life after unjust exile from Florence he adored. Many tourists love Santa Croce because it is decorated with frescoes and sculptures of Giotto, Donatello, Antonio Canova, Taddeo Gaddi, Antonio and Bernardo Rossellino and others. Baptistery in Florence (XII-XIII cent.) surprises with its difference between external architecture and real internal structure. You can see three floors outside, but in fact there are only two floors inside. Moreover the first “outside” floor is much lower than it is inside. La Cattedrale di Santa Maria del Fiore cathedral amazes with Filippo Brunelleski dome which elevates above the whole city. It was planned to lodge all citizens of Florence in this enormous church. At the same time the purpose of this creation was to prove the advantage of superb Florence. The architecture of the city is obliged by its greatness to many famous artists. Giorgio Vasari is one of them. He started the vaulting of the palace with Uffizi gallery and finished Piazza della Signoria ordered by Kosimo I Medici. Medici dynasty affected political and cultural life in Florence up to XVIII century. Their dominance was spread even beyond the city. Pope X Leo is one of the representatives of this powerful family. There is an old bridge (ponte Vecchio) that covers the Arno not far from Piazza della Signoria. In mediaeval times there had been a lot of butcher and fish shops which later were outnumbered by jewelry shops. Trade traditions have preserved till present. Not only you can estimate the quality of goldsmith’s work but also buy a lot of souvenirs. If you couldn’t find anything here try other shopping streets like via Tornabuoni, via Calzaiuoli, via Cerretani, via del Corso. Porcellino fountain may help you to find wellbeing if only you touch the snout of bronze pig. Legends say the coin dropped in this fountain makes you come back to Florence where you experience unforgettable feelings of life. 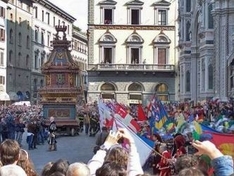 Easter in Florence involves the old tradition of the “Scoppio del Carro”. The name of the ceremony is translated in a rather unusual way, “the explosion of the cart”. The colorful ceremony has a long history dating back to the times of the first Crusade. The rules of historical football differ greatly from the modern ones. The most remarkable difference is the number of players. Teams of 27 people come to the football field by the Santa Croce Cathedral. The game lasts 50 minutes.